1. 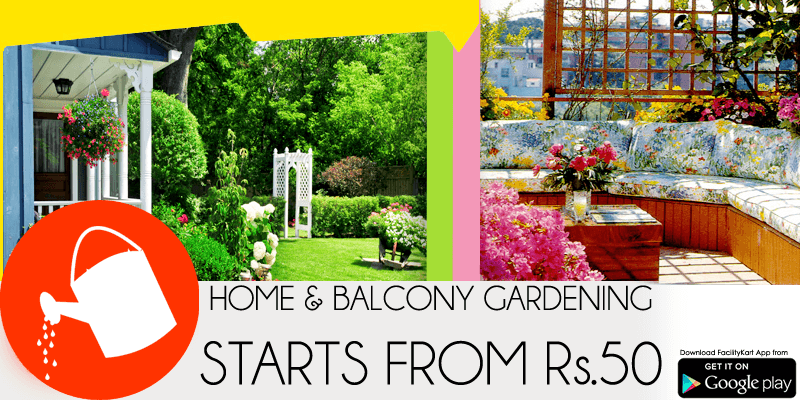 Setting up new garden at your balcony (Upto 10 Gamla) Our gardener will visit and help you in setting up a garden at home. 2.Outdoor Lawn Garden Creation Setting up lawn can not be possible without a primary landscaping knowledge. Our gardener will assure you full assistance on it. 3.Garden Plant Pruning Messed up garden is such a headache, we will take care of your beautiful plant with beautiful shape cutting and other related service at your door step. (Upto 50 sq. ft). 4. Garden Landscape Designing If gardening is your hobby, we will help you in nurturing it. Our package includes water sprinkle and seeding. Customer need to pay for seeds. Shown Price includes for upto 10 Gamla(pots). 5. Garden Spraying (pest and insect control) Pest can hamper your dream of beautiful garden. Book this service to keep your adorable plants healthy. Above mentioned price package covers upto 10 Gamla (Pots)..
6. Garden Maintenance AMC (medium sized area) Our gardening AMC service covers lawn(Upton 20 sq. ft.) and 10 Gamla(Pots). Services includes Grassing,cutting,water sprinkling. Extra charges applicable for extra seeds. There will be minimum of 4 visit in a month..(Upto 50 sq. ft). How we are different than others? We do not just send any tom at your home to take care of garden, We send an qualified and verified expert.